The festival of Moors and Christians in Caudete has a history of more than 400 years and is declared of Regional Touristic Interest. Each year these festivals stir up the Caudetan social scene and attract thousands of visitors. There are currently five troupes: Warriors, Mirenos, Tarik, Moors, andLa Antigua, the oldest of the groups being the Warriors and the Moors. These troupes adopt their original military structure with rankings that are preserved into the present: captain, sergeant, champion or standard bearer, and squad leader. The parades of The Entrance and The Felicitation take place the 6th and 9th of September, respectively, which are the two acts that attract the most visitors. In them, the five local troupes parade in squads to the sound of festive music, displaying incredibly beautiful vestments which in most cases are pure artisanship. Among the festive acts of a more playful nature there are others mixed in that are of a religious character. So, the Procession of the transfer of the Virgin on the 7th, from her sanctuary to the town, is equally spectacular and numerous in participation. She is received in the place of The Cross with aruedo de banderas(presentation of banners) andruedas de volantes(parade of “ruffles” – typical dress worn by each troupe) and the procession continues to the church of Saint Catherine with salutes of arquebusiers. 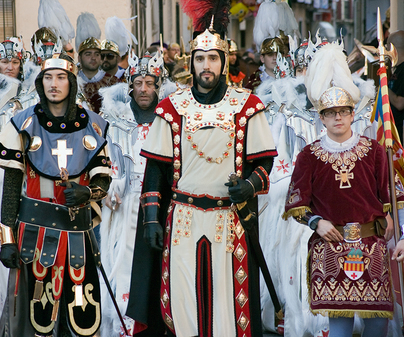 The General Procession on the 8th begins at the door of the church, wherethe volante ofeach troupe salutes the Virgin, followed by the arquebusiers of the troupe. Along the procession route they do two completeruedos de banderas, one in Plaza del Carmen and the other in the Church Square. Finally, on the 10th the Virgin is accompanied in procession to her sanctuary, with a newruedo de banderasin the open area in front of the sanctuary. 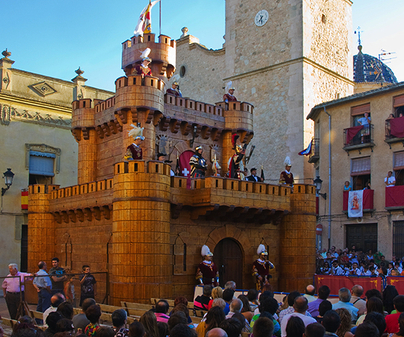 The Episodios Caudetanos are preformed in the Church Plaza on the 7th, 8th and 9th of September. It involves a historical drama written in verse that has its origins in the 17th century. The long history and cultural value of these acts make them a declared Asset of Cultural Interest of Castile-La Mancha. The theatrical performance is divided into three acts, dramatizing, on three consecutive days, the Muslim invasion of Caudete, the Christian Reconquest, and the appearance of the images of Our Lady of Grace and St. Blaise. 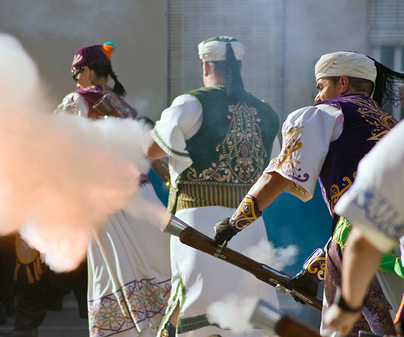 Another spectacular act of the festival is Las Guerrillas, simulations of the fight between the bands of Moors and Christians, where the gunpowder and shots of the archebusiers are the main attraction. The weapons used are made by Caudentan artisans. The Ruedos de Banderas in front of the Patron Saint (the Virgin) are one of the most moving acts of the festival. They are celebrated on the 7th, at the location of The Cross during the transportation of the Virgin, on the 8th during the Procession, and on the 10th in the open space in front of the sanctuary. The four troupes that have a banner - Antigua, Warriors, Moors, and Tarik- take part in the ruedo, while the banner of the Mirenosis situated alongside the Virgin. Other traditionalruedos de banderasthat take place in specific places, like the Church Square, Plaza del Carmen, El Angel, the City Hall, and the New Square, making a shortruedoin these places. Another unique act of the festival is the Reuda de Volantes. The role ofvolanteis the dearest and most loved of all those of the festive roles, seeing as it is performed by very young children. TheRueda de Volanteis a salute of veneration that these children do towards the Patrona. 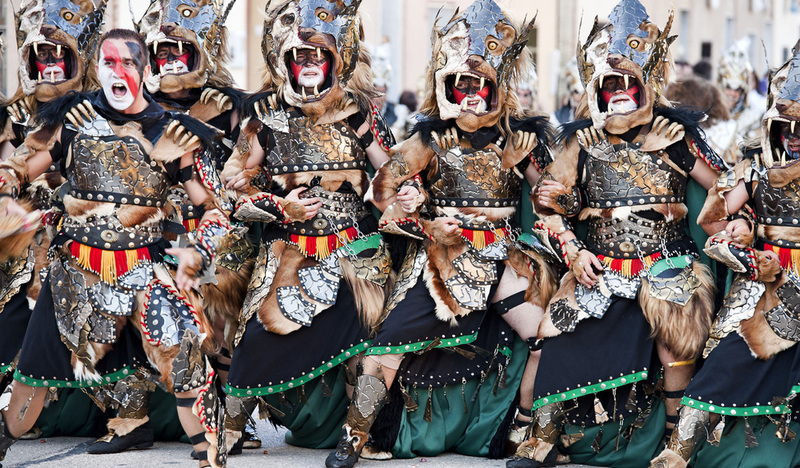 Each troupe can have between one and threevolante, that go accompanied by their captain in each of the acts in which they participate. Depending on the troupe, eachruedahas a certain protocol and peculiarities. The church square is the stage where the Episodios are played. It’s worth going well in advance to have a good view of the wooden castle that serves as its stage, as well as to see the previous guerrillas between the Moor and Christian factions.